When I learned that former Yankees third baseman Gil McDougald died one week ago, I thought immediately that I should write about him. Then I realized that I didn’t know much about him. 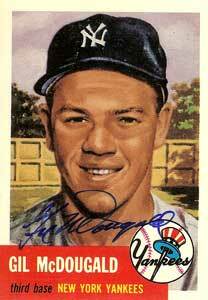 His last season, 1960, was my first as an attentive follower of baseball (and passionate Yankee fan). Thus, he occupies a central role in my baseball memory, but more in the abstract than through any concrete images of him. That 1960 Yankee team was a great one. My father took me and my brother to an April game, only for us to learn it was rained out as we searched for parking. We would return for game three of the World Series, a fabulous victory over the Pittsburgh Pirates in a fabled Series. There’s much I could say about that season, and I imagine doing so some day. For now, I’ll limit myself to just a few thoughts. I always think of the Yankees infield that year as comprising Moose Skowron at first, Bobby Richardson at second, Tony Kubek at short, and McDougald at third. The third baseman of that era whom I got to know much better than McDougald was his successor, Clete Boyer, younger brother of the Cardinals’ Ken. Looking over the stats from 1960, though, I was surprised earlier today to discover that McDougald was already on his way out that year, with Boyer playing more games at third than McDougald did. Casey Stengel, who would be fired after the World Series loss to the Pirates, moved the players around far more than I remembered. McDougald played 84 games at third and 42 and second; Boyer played 99 at third and 33 at short. Kubek played 133 at short but also played all three outfield positions. Richardson’s outings were more stable — 141 at second and 11 at short. The combinations were dizzying. I had the impression that Elston Howard had supplanted Yogi Berra behind the plate by 1960, and the stats bear that out. If the DH existed, Berra would probably have taken on that role. Instead, he caught 63 games in 1960 (compared to 116 the year before and 15 the year after), while Howard caught 91 in 1960 (compared to 43 the year before and 111 the year after). Of course, the Yankees had the luxury of a third first-rate catcher, Johnny Blanchard, who would be behind the plate for the fateful final pitch of the season, the one Bill Mazeroski . . . well, never mind. As long as I’m going around the field, I’ll remind you that Roger Maris was in right in his first season as a Yankee, alongside Mickey Mantle. He would hit 39 home runs, second to Mantle’s 40, but win the MVP award ahead of Mantle. Their home run competition the next year is the stuff of legend, with Mantle succumbing to health problems and Maris moving well ahead late in the season. Again Maris won the MVP ahead of Mantle. Mind you, these are the first two seasons that I followed baseball closely. I had no idea this wasn’t normal. I was spoiled. And who was in left field? I suppose that’s something of a trivia question now. It was Hector Lopez, a pioneering ballplayer from Panama. The most striking thing to me as I review McDougald’s 1960 teammates is how young many of them were. Boyer was 23, Richardson and Kubek 24, Maris 25, Mantle still only 28, and Skowron 29. This could have been a team for the ages. And indeed, they would make the World Series five straight seasons, from 1960 to 1964. But Mantle had injuries, Maris was haunted after 1961, Kubek would retire at 29, Richardson at 30. No wonder the Yankees fell apart so quickly after losing the 1964 series to the Cards. Playing with the Yankees for 10 seasons, McDougald was a five-time All-Star and a gifted fielder, appearing mostly at second and third but also at shortstop. He helped preserve what became Don Larsen’s perfect game in the 1956 World Series against the Brooklyn Dodgers when he threw out Jackie Robinson in the second inning after Robinson’s liner was deflected to him, caroming off third baseman Andy Carey. The next spring, McDougald was enmeshed in another long-remembered baseball moment, this one bringing sadness. On the night of May 7, 1957, at Cleveland’s Municipal Stadium, McDougald drilled a line drive off a pitch from the Indians’ brilliant young left-hander Herb Score that struck Score in the face. Only in his third season but seemingly destined for the Hall of Fame, Score remained on the ground for several moments. He was carried off the field, having sustained a severe injury to his right eye and a broken nose. After the game, McDougald told reporters, “If Herb loses the sight in his eye, I’m going to quit the game.” McDougald went on to finish fifth in the balloting for the A.L.’s most valuable player. Score, the league’s strikeout leader his first two years, regained his vision but was sidelined for the rest of the season. He later developed arm trouble and was never again a successful pitcher. Like Score, he had been victimized by a line drive, this one hit by Yankees outfielder Bob Cerv during batting practice before a game in August 1955. McDougald, who was standing near second base, was struck in the ear. He missed only a few games, but he gradually began to lose his hearing. By the 1980s, he had become almost totally deaf and had withdrawn from baseball old-timers events and other social situations. His deafness remained unknown to the public until he spoke about it in an interview with Ira Berkow of The New York Times in July 1994. Physicians who read the article told McDougald of a surgical procedure called a cochlear implant, which converts sound to electronic signals. He underwent the implant in November 1994, and tests the next January confirmed that his hearing was essentially restored.